She is a coupon machine. Just may come in handy. Remember the Queen & think twice! You can get free stuff too! I always knew that I had 2 very creative and entrpreneurial daughters!!! Wow I wondered if I could spell that word. I know where to go when I need a chocolate fix! I am wiping up my drool. 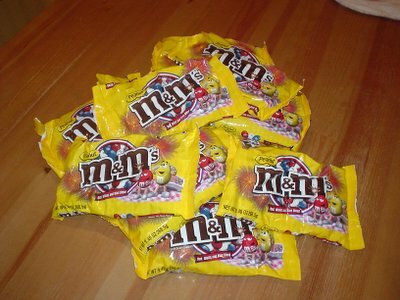 Peanut m&m’s are my all-time favorite candy. Fortunately, Germany has them too. But for FREE???!! That is so great! How did you get so many coupons?? I pay a small subscription fee and everyweek receive a detailed spread sheet of which coupons I should use based on grocery store sales and then I never pay more than 50% for my groceries. I love it when I pay $100 for groceries and at the bottom of the receipt it says “You saved $100! The game does all the figuring for me, then I do the choosing and clipping and saving. Such fun!